It occupies a middle ground between gelati on brioche and sangkhaya with soldiers. Morgenstern's avocado toast ($6) is in fact avocado ice cream toast — a firm shmear on a stalwart, lightly browned slice, dressed with pepper, sea salt, olive oil, and condensed milk that's been thinned out so it drizzles better, and so it isn't overly sweet. This is a breakfast toast, after all. Available as part of a strange and beautiful morning-only menu (February 2015 only) to help fund the second issue of Brutal magazine. Previously: In a two-scoop cup of jaggery atop durian-banana ($6), you'd expect the latter — which features the infamous "king of fruits" — to have the stronger flavor. Jaggery, you may know, is an unrefined sugar usually made from palm sap. Often it has a golden brown color and molasses-like undertones, both of which were nearly absent in the scoop on top. The paleness of its company, however, didn't diminish the durian-banana. To my delight that scoop tasted very little of banana, which is employed more to temper the durian pungency and to help smooth the texture. What comes through is the lush and fragrant flavor of the best durian ice cream in the city. Fourscore pommes frites from New York restaurants have been collected and lovingly mounted for this two-day exhibit. Though sponsored by a condiment company, Sir Kensington, with aspirations of greater commercial success, this "tribute to ketchup's most beloved delivery vessel" has been curated (and annotated) with uncommon charm. 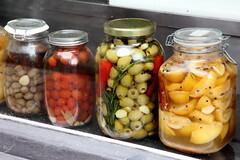 The closeup shows a schmaltz fry from The Harrison, which according to recent accounts will be extinct, at least in its current habitat, by the end of the year. The counterman's Expos cap wasn't only for show: An order of "one black, one white" duly scored two bagels ($1.50 each), one poppy, one sesame. Compared with most of their New York kin, bagels made in the Montreal style are crispier, a touch sweeter, and tend to have less heft and more hole. (Black Seed's are rolled by hand; your bagels may vary.) Next time I'll try one with toppings, but the mark of good bagels like these is that you can enjoy them unadorned. (This venue is closed; gelati, but not sorbetti, are still available at other outlets.) Brightly flavored strawberry and lemon sorbets (small, $4.80). 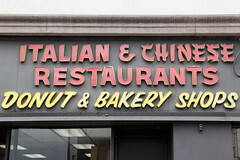 Typography recapitulates availability of equipment for Chinese restaurants and American bake shops. The Italian lettering does taper slightly, to less dramatic effect. 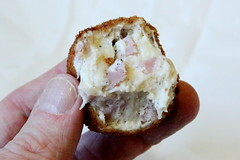 Tiny tiles of boiled ham — prosciutto cotto — were famously employed by Joe's Superette in its fried-to-order prosciutto balls. That venue shut its well-worn door in 2011, but a former manager, reported Chowhound, prepares them on Prince St. to the old recipe. Mine, fresh fried, were meant to be a little cool on the inside, said the counterman, the better to show off the flavors of mozzarella, asiago, and parmigiano-reggiano. Though the going rate in Soho ($1.25 each, no minimum) is about twice the price I last paid in Carroll Gardens, it still seems like a deal. 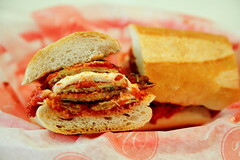 Invariably a basil leaf is slipped between the bread. (This venue is closed.) It's the difference-maker that distinguishes a Tunisian sandwich from the pedestrian tuna-and-egg variety.